Today’s “Dream Home” comes from the gorgeous Caitlin Wilson of the synonymous design firm and style blog. Caitlin has lived all over the world, so she has had the opportunity to hone her style while reveling in the best design each continent has to offer. Enjoy! It's an honor to be here today at La Dolce Vita- a blog that I have admired for quite some time! This was such an enjoyable feature to participate in because I actually got to sit down and think about my own home for awhile and I must admit- that I got pretty indulgent! I started thinking of all the little things I would do...that would add lots and lots of money to the bill...but hey it is supposed to be a dream home, right? So here we go, off to dream land... Although I've created some funky spaces- I have pretty traditional roots so when it comes to my dream home it would be more traditional in it's architecture & exterior. 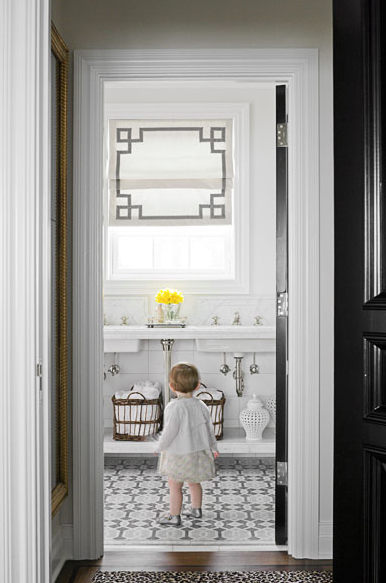 I was raised in homes with crown molding and paneled walls so if I were custom building or remodeling my own home, I would add all of that detail and charm of elegant, traditional homes. I'd go for dark wood floors, subtle tonal walls, and lots of built-in shelving. After 2 years living abroad in London, Dubai, and Hong Kong- my husband and I have a love for other cultures and are fascinated by the middle-east and Asia. I would hope that the vibe of our home would be refined, sophisticated, well-traveled, but comfortable and not too serious. We plan to live abroad again so I hope that at some point we will be able to bring back more substantial pieces and antiques from our travels and be able to display them throughout our home. I want our home to tell a story of who we are and the fun experiences we have enjoyed together as a family. My husband and I are both originally from California so we'd love to live in there again someday...so beachfront or waterfront would be ideal of course! 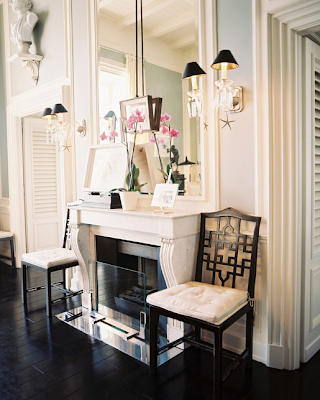 The entry is one of my favorite features of a home, so it has to be stunning. 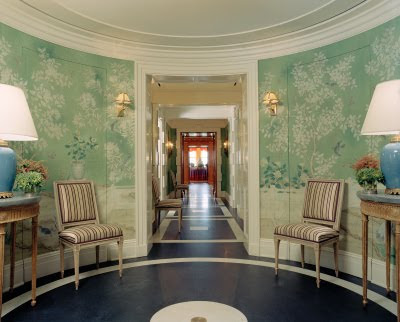 I absolutely love a round foyer- especially when it's covered in hand-painted chinoiserie panels like Tory Burch's house. I'd love to do a monogram painted on the floor or on a rug of the entry and I'd definitely add a chandelier. The kitchen is actually much more subtle than the rest of the house. I want big windows to let in lots of light, simple white cabinetry with GOLD or brass hardware (I'd love it to be a greek key type of pull). I'd do calacutta gold marble countertops and a more interesting backsplash than this one but not too crazy. I'd add some dramatic lighting like a gold chandelier and definitely some fun chairs- love the flair that the bamboo adds. 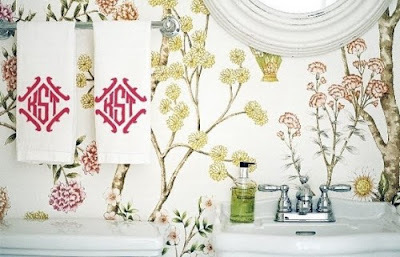 For the guest/powder bathroom, I would do a beautiful, bold wallpaper- probably a modern chinoiserie with monogrammed touches of course. I want the dining room to feel dressy and dramatic, so I'd opt for grasscloth- I always love the formal look of silk grasscloth- I'd probably go lighter for the color, maybe aqua or green. And how about a gold ceiling and paris flea market chandelier? Yes please! 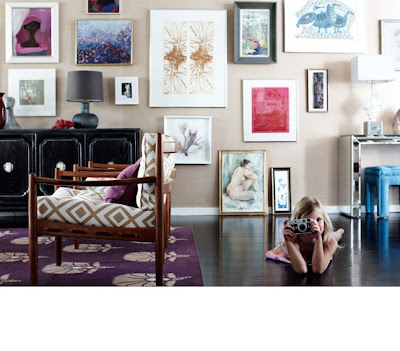 The family room will be eclectic and lived in, not too formal. I want my kids to feel comfortable and creative so I want to make sure that the family room where we hang out and relax is a place that is fun and cozy. The formal living room, on the other hand, will be very formal...inspired by the ladies library by Kemble Interiors. 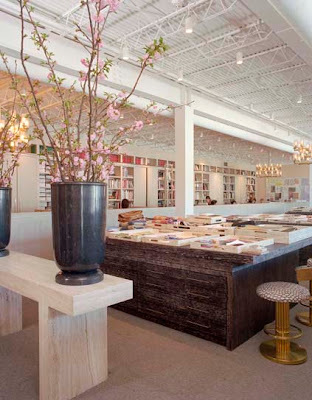 Full of books, silk furniture, and a tete-a-tete! And one day in my living room or sitting room, I WILL have a coral linen couch...anywhere, just give me that coral couch! 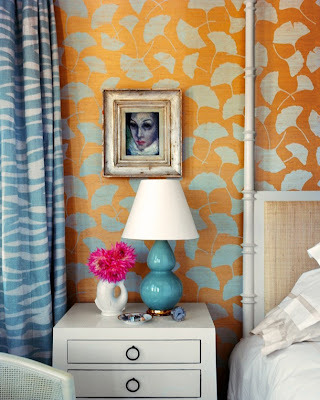 My dream house would not be complete without custom wall to wall carpet...so each of the bedrooms would have fun patterns and colors. 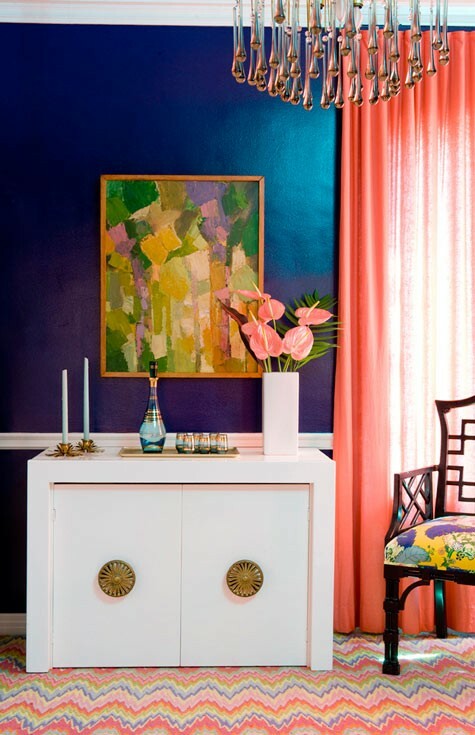 I wouldn't go rainbow colored in every room- but you know I'm not afraid of going bold! 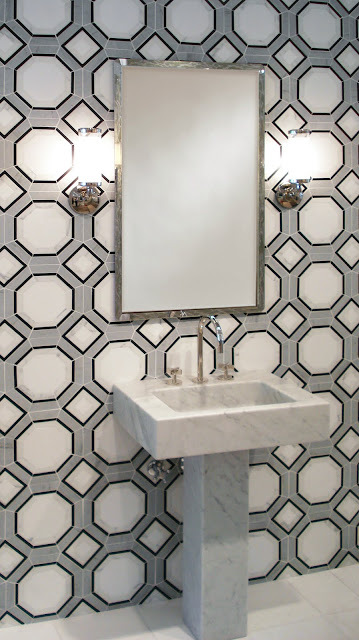 For the bathrooms, I would definitely go wild with tile...using all Ann Sacks marble patterns. Geometrics in greys, blacks, whites. 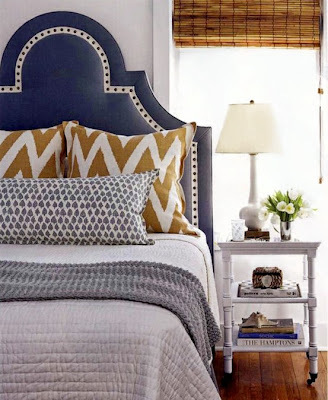 I would love for my daughter, Olivia's room (and any other daughters I hope to have) to have darling upholstered headboards with built-in shelving. 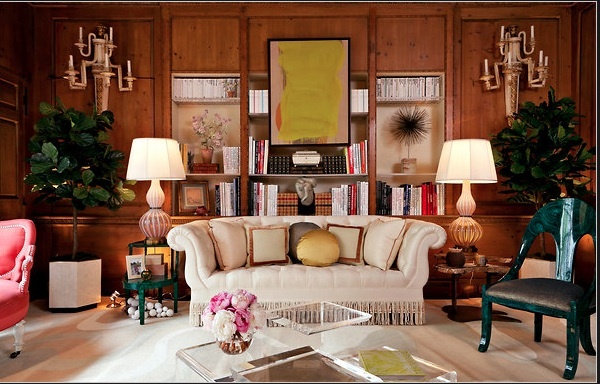 I love the little nook feel- fit out with sconces and little cozy spots to sit and read and relax. Each of their rooms will reflect their personalities and favorite colors ( I want them to be involved in the process because I loved that when I was younger) but I would hope that I could convince them to keep it fun and feminine. I hope to have some boys in the family some day too so I'd keep their rooms pretty cool and casual. I know we'd have to go through the superhero phase but once they get older, I'd try to force some cool masculine headboards with funky fabrics and throw in some antlers from grandpa's collection. I'd love to have a four poster bed with an upholstered headboard combined. I've always loved the look of a four poster bed but I absolutely hate not having a padded headboard (because I work on my computer in bed A LOT!) I'd go for bamboo details and monogrammed bedding...to die for! And let's not forget that I need a huge bedside table- for all the stuff I tend to need right next to me...I find myself sleeping with bottles, pens, paint decks, and fabric swatches way too often. This double shelved beauty would be absolutely ideal! For the master bath- I want it to be calm and serene. A beautiful stand alone bathtub so I can relax and rejuvenate after a long, hard day of work and mothering duties. I'd probably still do a wallpaper but keep it a little more tonal and peaceful. And last but definitely not least...the home office! This is super important to me because I always want to be able to work from home. Ideally, I'd like to have a huge office space that is connected to the house somehow or on the same property. 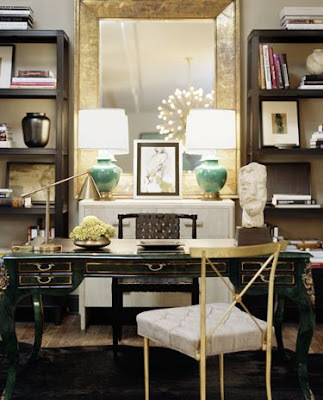 I'd go Kelly Wearstler style with huge tables and shelving to keep everything organized. 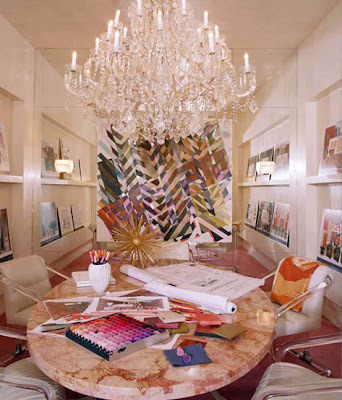 I'd need a fabulous personal office where I can go for inspiration and quiet. and a killer conference room of course to meet with clients and display design boards! And there you have it...my dream home. It's not too much to ask for, right? Thanks so much for having me Paloma- I really loved getting lost in my dream home! Those are some gorgeous picks there! 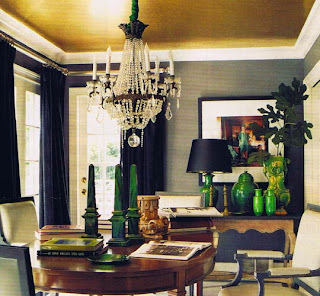 My favorites are the bright blue room, the large gold bedside table and ceilings in that dining room. Yes,please! So many great and inspiring photos! That kitchen always get my attention, every time I see it. Love it. Love Caitlin's style! Traditional with a twist. I especially love the kitchen and little boys room. may I please move in? Wow! You went all out! Well done. Those are some gorgeous, eye-candy photos! Loved reading this - so many great inspiration shots! And I couldn't agree more about a coral linen couch. Yes please! I also love Caitlin's style. . .she obviously just has fabulous taste that she was born with. But I think it's hard for some people to really trust a designer when they don't have the academic background to give a really solid design foundation. 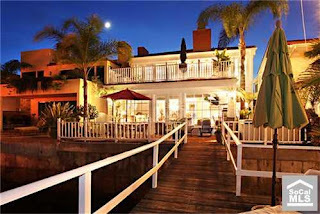 For example, that first house that she posted. . .it's not Colonial or Cape Cod at all. It's 100% Arts and Crafts. And even if you make the argument that she didn't specifically say that *that* picture is of a Colonial or Cape Cod home, she does say that she loves "Colonial or Cape Cod. . .big porches. 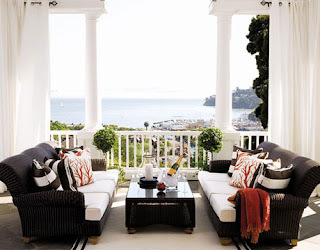 . ." and if you've studied even a tiny bit of architectural history, you'll know that those two styles are specifically styles that have a notable absence of porches. Ha. It's fine to not have an academic arsenal to back up good taste, but it can get one into trouble (i.e. call your credibility into question) to throw around terms incorrectly. 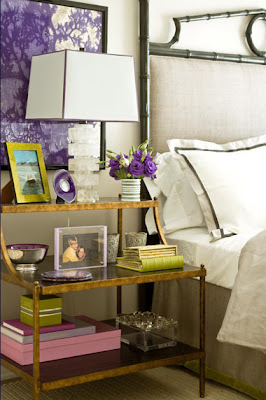 Any idea where the double shelf gold bedside table is from?